Helping readers find the books they will love, online since 1996. An article by Scott Turow on why the Amazon purchase of Goodreads is not a good thing helps to clarify why I left. Books are meant to be shared and talked about and I loved the community, the easy way to keep track of books read. My first thought was I could switch to Shelfari or LibraryThing but it turns out that Shelfari is owned by Amazon and they also own Abebooks which owns 40% of LibraryThing. What to do?I'm not the only one thinking about this. LibraryThing chimed in on it and so did several LibraryThing users. I've kept a list of books I've read since sometime in the early 90s. The original logs were a section of my Franklin Planner but I moved my listing into a Q & A database where I could access info more easily when working on books for the Genreflecting series. When Symantec quit supporting Q & A I eventually found FileMaker Pro and it worked pretty well. I tried LibraryThing, Shelfari, and Goodreads when they started up and Goodreads was just so much easier for me than inputting all the bibliographic info and cover images into my database. So now I'm back to FileMaker Pro and sharing my reads in this blog. Westerns are the great American genre. They extol the virtues of the beautiful and rugged landscape and the independent spirit that explored the frontier. The website for Women Writing the West states "The West represents a way of thinking, a sense of adventure, a willingness to cross into a new frontier." While some new Westerns are published each year, the bulk of titles available include lots of reissues. The genre is often considered as a subsection of historical fiction but not all Westerns are set in the past. 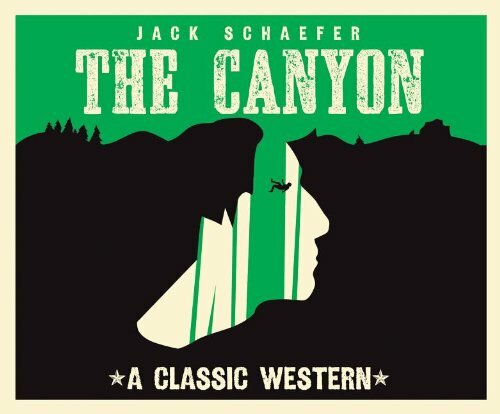 This time around, my reading plan called for a classic western and I chose to listen to read with my ears this go round. An audio version of this classic Western, first published in 1953, came out in February, 2013. It is the story of Little Bear, a young Cheyenne man who has very short legs. His parents died when he was very young and was fostered as he grew to adulthood in the northern plains. When he continues to pass up opportunities to go out with a war party because of deep convictions. When he asks an elderly warrior to sponsor him when he goes alone on a retreat to fast and commune with the spirits he ends up falling off a cliff and surviving with a broken leg. At the bottom of the canyon is a small, isolated herd of buffalo. Little Bear's life in the bottom of the canyon is harsh but he performs amazing feats of survival from setting his own compound fracture, fighting the infection, making tools, clothing, and finding food. His resourcefulness while facing overwhelming odds is impressive. His two weeks stretch into a number of years and his future is shaped by the spirits he sees in his dreams. I liked the extreme self sufficiency of the protagonist, the beautifully depicted landscape, and the depictions of his relationship with the natural world and the animals with whom he shared the canyon. I'm going back to posting my reviews and reading logs here. Trying to figure out how to use FileMaker Pro with Blogger to make it a little easier to keep current. Open to suggestions. This amazing debut novel combines elements of Jane Eyre, "Beauty and the Beast," and more in a gothic tale set in a steampunk world. Jane Eliot’s face was horribly disfigured in the war against the fey. She wears an iron mask to hide the horrible injury and to keep it from affecting anyone who looks upon it. When Jane loses her teaching position and her sister makes an advantageous marriage, Jane accepts a job as governess to Dorie, the child of a prominent artist whose wife had been possessed by a fey when pregnant leaving the child afflicted with the curse of telekinesis. The house is a huge crumbling mansion on the edge of a dangerous wood. Jane’s job is to teach Dorie to use her hands rather than her mind to move things and the five-year old has no intention of doing so in scenes reminiscent of the process Anne Sullivan used in teaching Helen Keller. The master of the house is an artist who crafts masks for well-to-do women. The masks hanging near his studio in the ruined part of the manor are hideous but the women who visit him are beautiful. Poule, the half Dwarvish butler, adds another viewpoint on the conflict between the humans and fey. The eerie sense of impending disaster grows as Jane comes to love both her charge and her employer. Gothic tales were quite popular in the 1960s and in the late 18th century. Could they be making a comeback? Are they the next “big thing”? 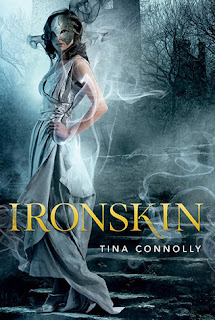 Readers who were fond of the Brontes, or of more recent gothics such as Juliet Dark’s Fairwick Chronicles that started with The Demon Lover or Caitlin Kittredge’s Iron Codex that started with The Iron Thorn will love this. A New Trend in YA Lit? It is so strange the way things seem to crop up in clumps. 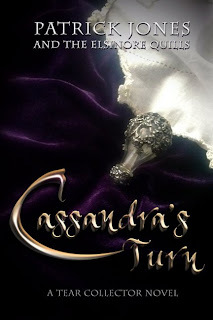 Yesterday I finished reading the ARC of Cassandra's Turn by Patrick Jones and the Elsinore Quills and went to bed thinking about the collaboration between the author, his teen co-authors, and several other cool people (including Spring Lea Henry! Cathi Dunn Macrae! David Boop! Melissa Powell! Victoria Hanley! and more) who worked together with them to create this book. They are all cited responsibly (another 21st century skill). 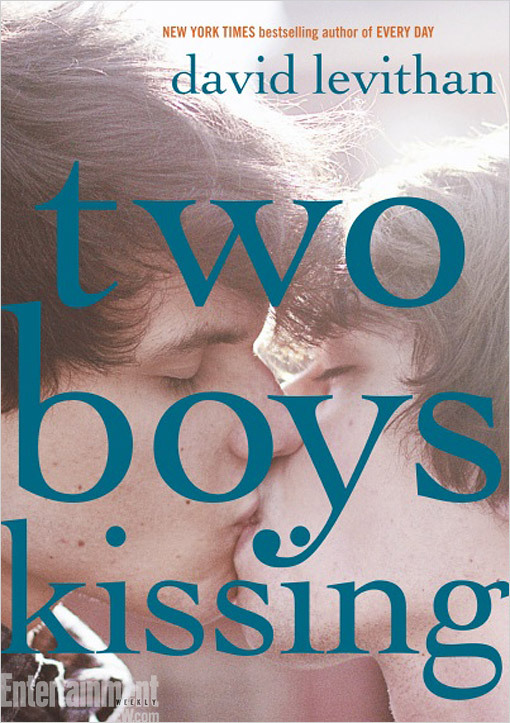 First thing when I checked Facebook this morning, I saw a link to an EW.com article about David Levithan's forthcoming Two Boys Kissing that talks about him working with his teen readers on creating a cover image that really works for the book and how he got the concept for the book from a comment from a fan. Talk about those "21st century standards" for education keeps being bandied about. Unfortunately in my area, schools are gutting libraries which are the laboratories and learning environments for those very standards. I know this is not an isolated situation but one going on across the country as schools are required to test rather than to teach. The really bright side about these two books is that readers and writers are finding ways to collaborate and make something grander using this synergy. Labels: Cassandra's Turn, Cathi Dunn Macrae, David Boop, David Levithan, Elsinore Quills, Melissa Powell, Patrick Jones, Spring Lea Henry, Trends, Two Boys Kissing, Victoria Hanley, YA Lit. Went to pick up mail today and came home with a wealth of wonderful titles. Jim Van Pelt’s latest story collection, Flying in the Heart of the Lafayette Escadrille, arrived. B.A, Binns, the author of Pull which was well liked when I took it to youth corrections, has a new book, Being God that looks good. My old friend Patrick Jones who writes gritty realistic books that have special appeal to “at risk” teens and reluctant readers has a new book, Cassandra’s Turn, coming out in April, published by Grumpy Dragon. On top of that I also received new books written by Melina Marchetta, Pete Hautman, and Robin Benway. I am giddy with trying to figure out what to read first, just as soon as I finish Nancy Kress’s Flash Point, a first YA novel from a Hugo and Nebula winner. 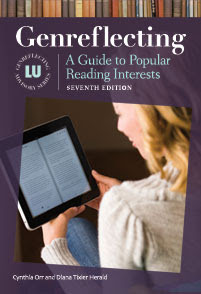 I've been putting in long hours indexing the 7th edition of Genreflecting, due out next month! It is the reason why I haven't updated the Genrefluent site recently. I have been proceeding with my reading plan by delving into a genre that isn't my favorite, maybe even my least favorite genre and I'll be talking about it here soon. Until then, happy reading! Read along with me as I share my reading plan for the year. Diana Tixier Herald, winner of Novelist's 2014 Margaret E. Monroe Award, has been posting book recommendations to the web since 1996. She is the author of several editions of Genreflecting, Teen Genreflecting, Fluent in Fantasy, and Strictly Science Fiction. She is the series editor of the Libraries Unlimited (ABC-CLIO) bestselling Genreflecting series. 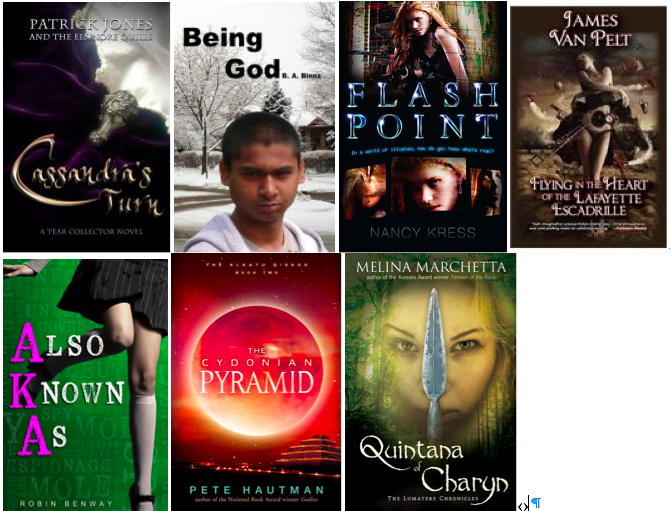 Many of the books I review on this site have been sent to me by publishers, authors, or publicists. I do not receive compensation for the reviews. I only review books I like and can recommend to other readers because I will not waste time reading or reviewing books I do not like. I do not keep review copies after I am done with them. They are passed on to teen reviewers or donated to schools and other non-profit organizations. 1996-2018. Watermark theme. Theme images by duncan1890. Powered by Blogger.